Threats and Opportunities at Research Universities describes the results of a similar survey of 61 departments at research intensive universities. The information on these pages is derived from a poster (Acrobat (PDF) 1.4MB Jan6 06) presented by Randall M. Richardson and Susan L. Beck of the Department of Geosciences at the University of Arizona at the 2005 Fall Meeting of the American Geophysical Union in San Francisco, CA. Randall Richardson and Carol Ormand subsequently published a summary article in Eos in 2008. The abstract of the Eos article is available on the AGU website, and the article is available in the publications section of Carol's webpage. 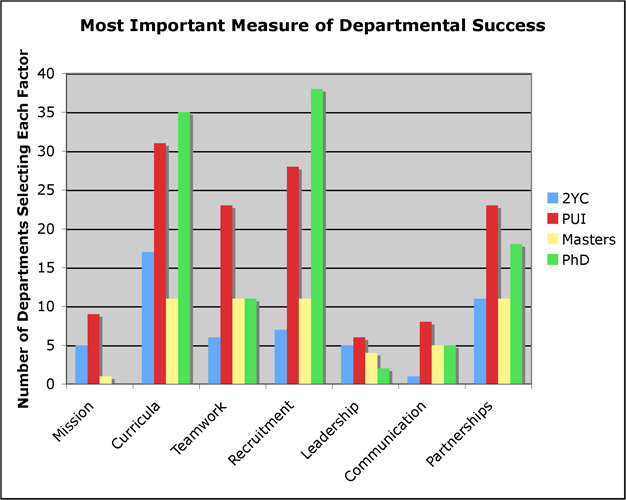 Graph of the most important measure of departmental success, according to survey respondents. Click on the graph to see a larger version. 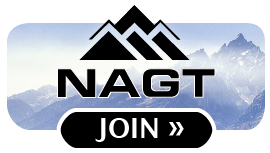 In 2005 we sent a request to just over 900 two-year, four-year, master's, and doctoral geoscience and atmospheric science departments in the US and Canada to take an online survey. 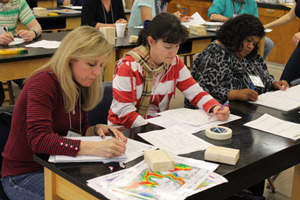 This survey grew out of an earlier survey of 61 geoscience departments drawn primarily from the American Association of Universities and a workshop on Developing Pathways to Strong Departments for the Future held in February 2005 at the College of William and Mary. At the workshop 25 participants discussed the state of geoscience departments and developed ideas for strengthening departments. A total of 364 departments completed the 2005 online survey for a response rate of approximately 40%. This new survey gathers demographic information, addresses perceived threats and opportunities, asks about the characteristics of strong departments, and addresses effective recruitment efforts for students and faculty, among other questions. Analysis of the survey results indicates that commonalities outweigh differences between various institutional types. 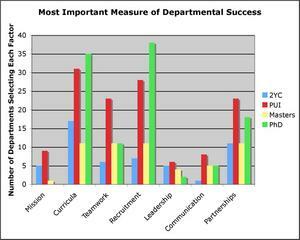 For example, a significant majority of departments indicate that effective curricula and recruitment are two of the most important measures of successful departments. Recruitment efforts show some variation between institution types, and there are some differences in opportunities and threats. Diminishing resources are a common threat across all institution types. 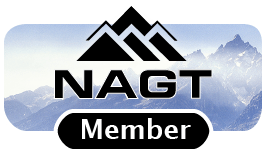 We sincerely appreciate Chris Keane of the American Geosciences Institute (more info) for help reaching the vast majority of departments, Beth Farley of the American Meteorological Society for help reaching atmospheric science departments, and Carolyn Eyles of McMaster University for help reaching Canadian institutions. This work was funded by NSF Grant # 0331930.